Outside of the YHA at Castlefields, we stand in a circle, our eyes closed, and imagine being a particle of water, deep underground. So begins the first of the Tales from the Towpath workshops. Envisioned as ‘an immersive piece of literature focussing on Manchester’s waterways’, the overall Tales from the Towpath project combines a textural treasure hunt, a multi-voiced performance on a traditional narrowboat, and workshops exploring the writing and building of immersive tales. As soon as I saw the MLF programme, I was begging to be the blogger for these events. Immersive literature aims to expand the possibilities of text and narrative by engaging with a mulitiplicity of media to widen the reach of words. On the treasure hunt – which is accessible for the duration of the festival and beyond – the four collaborating artists have placed their story around Manchester, to be uncovered using apps such as Zappar and OpenCache. They’ve also used micro-projection to scatter sentences on pavements, walls and across water, and designed origami narrowboats, beautiful artifacts which work as sculptural literature as well as intriguing 3 dimensional flyers. For Saturday’s workshop, led by the artist-writers Maya Chowdhry and Michelle Green, we were there to write the stories that, in the second workshop, will become immersive experiences. And, from the start, it was a peaceful, deep and internal process which brought up, I think for all of us, unexpectedly rich possibilities. You know how writing workshops usually function, with round-the-table introductions where everyone sounds so much more interesting than you and there’s a slightly competitive edge to the sharing of work? It wasn’t like that at all. We’d practised deep breathing, been outside for the visualisation exercise above and finished the first 15 minutes of free writing before we even shared our names. It was very liberating. And the writing continued to be very interior, focussing on a privately-known place, before widening with another foray outside to find an object which either fit with the space we’d been describing or had no place in it at all. 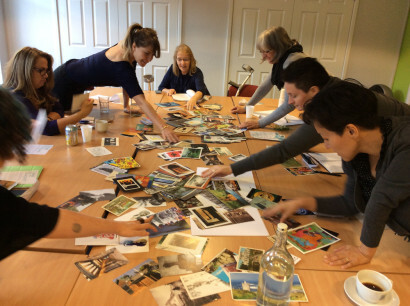 Michelle’s awesome collection of postcards formed the basis of the next exercise, as we each chose three images and turned them into characters, and we then took the characters, placed them in our landscapes, and gave them an objective. The final stage had us in collaborative huddles as we shared our day’s journey and brainstormed ways of using media – digital or otherwise – to bring our narratives to life. I came away with the unexpected bones of a poem, and a head buzzing with ideas. Around me were ideas for a ghost story to be heard in the dark in an empty swimming pool, a whodunnit set in St Helens with the idea of using verbatim speech, a Cornish giant exiled to Preston, and a triple-stranded female god investigating ideas of memory and displacement. I cannot wait for next Saturday! Go to www.talesfromthetowpath.net to discover how to access the story trail, and follow on Twitter @TowpathTales. You can also look out for the origami boats at the different Festival venues. Sarah Jasmon is a writer who lives on a boat. Blogging for the MLF is one of her favourite things to do, but she also has a debut novel, The Summer of Secrets, coming out next year. Come by and visit at www.sarahjasmon.com or @sarahontheboat.